What Should Democrats Demand in the Budget Showdown? If Republicans feel entitled to push pet projects in exchange for opening the government or avoiding default, Democrats should call them on it—and detail their own demands. Republicans entered the fights over funding the government and raising the debt ceiling with a list of demands. Here are some of the modest concessions they sought in return for not shutting down the government (and, now, re-opening it after they shut it down) and/or not tanking the global economy by forcing the United States to default on its debt: approving the Keystone XL pipeline, eliminating all federal funding for Planned Parenthood, or privatizing Medicaid. Democrats, for their part, have mostly just tried to pass “clean” bills on both instances, and in the case of a continuing resolution to keep the government funded, have even accepted sequestration spending levels. Playing with either—threatening to shut (and keep shut) the government or, worse, failing to raise the debt limit and forcing the United States to default on its obligations—is irresponsible politics. But if this is going to be a negotiation, Democrats should play offense with a list of their own demands. Even better, there are plenty of things they can put forward in negotiations that would actually have the added benefit of helping boost the economy beyond just keeping lawmakers from damaging it! 1. A public option for healthcare. Many progressives pushed hard for a system that would ensure universal access to health care, often called a public option and frequently accomplished through making Medicare available to all. That got stripped from the bill that became the Affordable Care Act. If Republicans want to make the fight about healthcare, progressives can suggest tinkering with Obamacare—by instituting a public option. This wouldn’t just make sure that everyone has access to healthcare—including those currently being left out by red states that refuse to expand Medicaid—it would also help control spending on healthcare. Medicare’s administrative costs are 2 percent of its spending, compared to 14 percent in the private industry. Its spending growth increased at a rate about 1 percentage point lower than private insurance from 1970 to 2002. 2. Universal preschool. President Obama has already put forward his plan to expand preschool to all. Democrats could stake out ground by not just demanding preschool for 3- and 4-year-olds but going even further to offer free, quality childcare (that pays workers a decent wage) for all. The benefits of free access to high-quality preschool are already well known. One study found that Chicago’s program will generate $11 for every dollar spent in economic benefits over a child’s lifetime. Another found that society stands to see a $9 return for every dollar spent in increased earnings and employment and reduced crime, need for public benefits and grade repetition. Well-educated Americans help increase the labor supply, which boosts GDP. None of these studies take into account the fact that universal preschool—particularly if it extends down to infants—is a huge benefit for working parents, particularly women, who are the default caretakers. 3. Raise the minimum wage and index it to inflation. Democrats have been calling for a raise in the federal minimum wage, which has been stuck as $7.25 an hour for four years. Worse, the tipped minimum wage is just $2.13, which hasn’t been raised since 1991. If the wage had kept up with inflation since its peak in the 1960s, it would be over $10 an hour. Fast food strikers have gone further, demanding a raise to $15 an hour, so as bargaining leverage Democrats can start at least that high and make sure it keeps rising as costs rise. And the good news is a raise would give the economy a much-needed boost. The Chicago Fed found that raising the wage to $9 would increase household spending by $48 billion, and even if the possibility of job losses is taken into consideration—which is pretty unlikely—spending would still go up by $28 billion, or 0.2 percent of GDP. 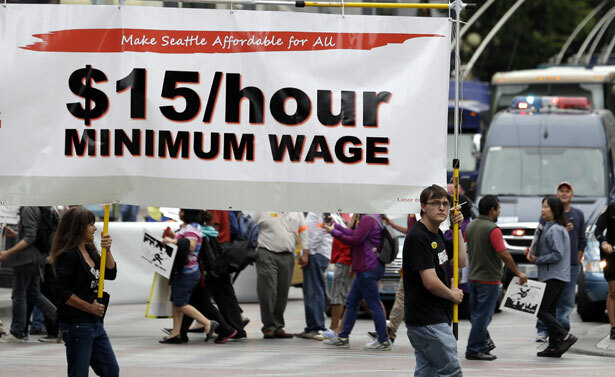 Raising the wage to $10.10 an hour would lift nearly 6 million people out of poverty. Not to mention that it would help close the gender wage gap and the racial wealth gap. 4. Free public college. It may sound far-fetched, but the cost isn’t quite so large as you might think. The Roosevelt Institute’s Mike Konczal has found that the government already spends $22.75 billion on tax breaks and incentives for the cost of higher education. The government also spends about $104 billion on student loans. But the cost of providing free public higher education has been estimated at about $127 billion, lining up close with the figure the government already spends on subsidizing college. Konczal points to evidence that a “public option” for higher education could do a lot to control tuition costs. It would also likely expand access to higher education for many that currently see it as out of reach financially, creating a highly skilled workforce and boosting economic growth. 5. Guaranteed paid family leave, sick days and vacation. The United States falls far behind other developed countries when it comes to paid time off. We’re the only advanced country that doesn’t have a policy guaranteeing paid vacation time. We’re the only country in the top fifteen most competitive that doesn’t have a paid sick days policy. We’re one of three countries out of 178 that doesn’t offer paid maternity leave, let alone paid paternity leave. Meanwhile, we rank at number fourteen in hours worked. Democrats have been pushing for paid family leave and paid sick days, but they can wrap in paid vacation time to push for more guaranteed time off of work. Paid family leave would help bring more women into the workforce, relieve the cost burden on families and close the gender wage gap. Paid sick days at the state level have been shown to spur job growth and enjoy strong business support. And taking time off of work to decompress makes workers more productive. At the very least, Democrats should be resisting the Republican push to keep sequestration spending levels in a “clean” CR funding bill. But they should think about playing offense and pushing for some policies that could do a lot for the economy. What would you include in the list of things Democrats should demand? Leave a suggestion in the comments or with the hashtag #DemDemands! John Nichols on the federal workers bearing the brunt of the shutdown politics.